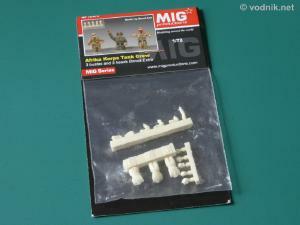 Afrika Korps Tank Crew set in 1/72 scale from MIG Productions contains three figures molded from cream colored resin. Parts are packed in a small zip-bag with a thick paper flap stapled to it. The picture on a flap shows completed figures and can be used as painting reference. 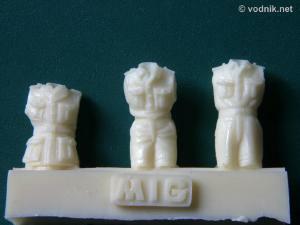 All three figures in the set are molded only from knees or waist up, so they can only be used in open hatch of a tank. Each figure has two separate arms, but we get five different heads, what gives some choice and possibility to better match the head style to the diorama setup. We get two heads with sidecaps and three with standard caps - one of each type has headphones on. One head has most of the face wrapped in a scarf. Two figures wear desert uniforms, but third figure seems to be wearing standard feld grau uniform - this means that most likely it can also be used in European war theater diorama. Click on picture to enlarge it. Close-up of heads and arms parts. 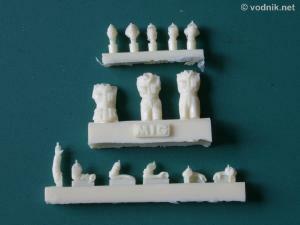 Figures are very well sculpted and molded. Details are crisp and particularly those on faces and hands are natural and well reproduced. There are no air bubbles and no flash on parts in my set. Resin pouring blocks should not be difficult to remove. On head and arms parts there are small resin "pins" added on top of each part, which have to be removed. 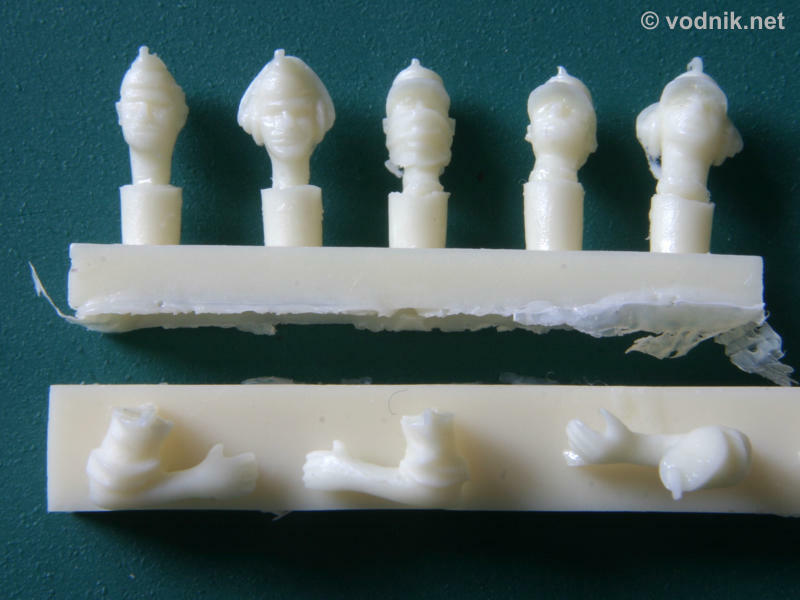 They were added to make sure that resin reaches all tight spaces in the mold to avoid incompletely molded parts. 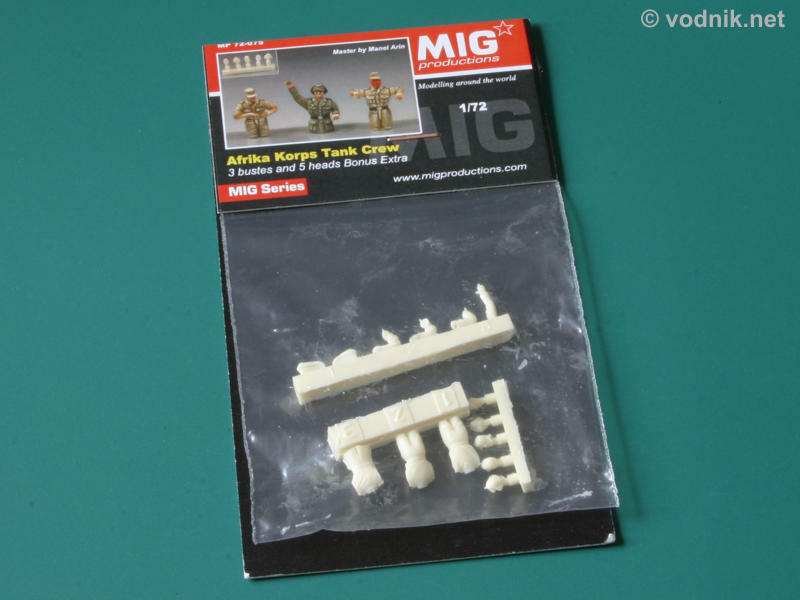 MIG Productions can be a high quality addition to any Afrika Korps 1/72 scale tank model and one figure can also be used in European scenery. Highly recommended!